It may only be November but the first frosts of winter will soon be here. We look at some quick, effective and simple tips you can put in place now to make your winter a trouble-free season around the home. A factor often overlooked when it comes to home maintenance is ensuring that water is drained correctly. Check your roof gutters and ground-level drainage for any signs of blockage, such as weeds or leaves, and ensure these are clear to draw away the worst of the water flow as ice and snow melts. A quick and effective way to combat ice on your driveway is to sprinkle salt on areas surrounding your home. Ensure that your driveway, heavily-used paths and steps are covered to improve traction and quickly dissolve ice. As winter sets in, the availability of food for local wildlife can decline. You can play your part by hanging bird feeders and keeping bird baths topped up to encourage them to flock to your garden. Load up on logs to make the most of a cosy fire during the colder winter months. Local garden centres such as Kirktown Garden Centre in Kirktown of Fetteresso, Stonehaven offer plenty of dry wood which can be stored at home until ready to use. Winter often brings with it a series of bugs and illnesses. You can start the fight against them early by boosting your immune system with healthier ingredients in your home-cooked meals. Leeks, garlic, greens and even sweet potatoes are high in zinc, which is a key element in promoting a healthy immune system. You can set a warming, comfortable tone in your home which will keep your family cosy on a winter’s evening by introducing heavy throws, comfy cushions and candles. 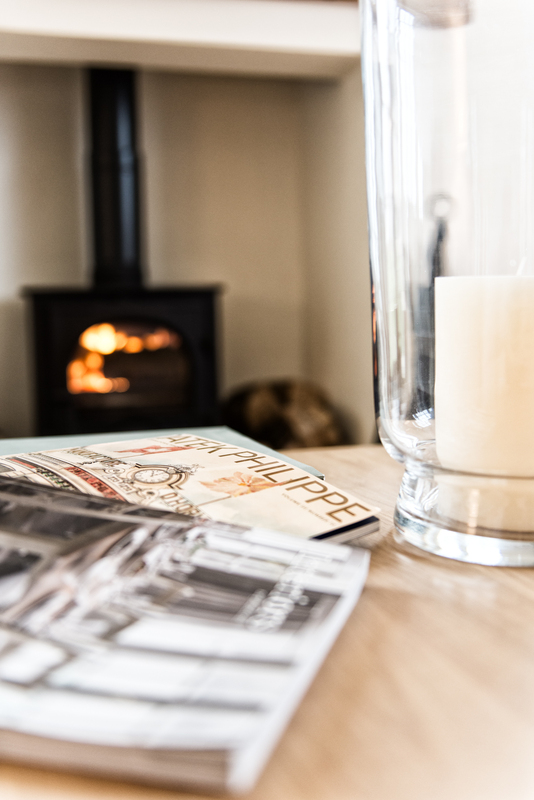 These accessories will help to create a relaxed ambience making warm evenings in front of the fire even more enjoyable. We would love to know what other tips and tricks that you would like to see on the Chapelton blog. Comment here or on the Chapelton Facebook page to tell us.